When someone complains in social media they simply want be heard. They want to voice issues to their social network so that their friends can know what company or product to avoid; they may want resolution; or they may simply just want others to provide moral support. 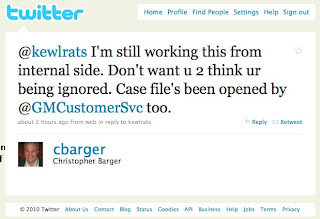 Sometimes companies are listening and may even actively respond to a complaint. The past two days I witnessed a very public version of this when one of the people I have come to know in the automotive twitosphere (I swore I’d never use that dumb word, but just did) had an issue with a Chevrolet Equinox he ordered a couple weeks ago. "The vehicle was paid for in full on Feb 2nd as we were told this as needed to lock in the incentives. We were also asked to hand over our trade-in at that time. This past Monday we paid our first loan payment to our financial institution. And all of this without receiving the car. (Still have not received it yet.)" Obviously this was an issue at the dealer level, probably with a lot of promises and the buyer will get the car very soon from the already paid car salesperson and now we have a very frustrated customer who is unsatisfied with a brand; though, fortunately Dali is not Kevin Smith and kept his cool, but he was definitely upset. Dali told me, "I was upset at the dealership buying process and excruciatingly long wait and faults, I found it extremely difficult to get an answer to my questions. This both stressed me out further and made me second-guess my purchase." Fortunately someone was listening. Early in the process, Dali received some support from his network of fellow automotive enthusiasts. The situation was spreading about Dali’s issue and spreading through a community of well-connected automotive friends. 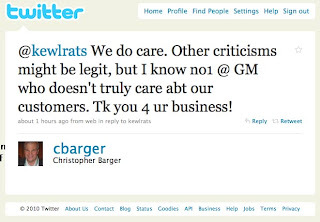 Fortunately, General Motors’ Social Media Team, led by Chris Barger (@cbarger), noticed there was a problem, as did some other employees GM has on Twitter. One very active GM employee Borger (@GMEmployee) caught this situation early and tried to correct the idyllic expectation created by Dali’s salesperson. It didn’t end there. GM’s Social Media team continued to work on the problem reassuring him that they were actively working to remedy the situation as quickly as possible. The team also made sure Dali engaged with the proper channels like GM’s Customer Care team (@GMCustomerSvc). Chris Barger further stressed that GM was committed, as a whole company, to make sure its customers needs are met. 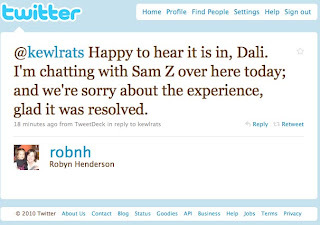 The actions taken online today demonstrated that care not only to Dali, but to everyone listening too. Fortunately the vehicle was in at the dealership and the problem was remedied even if it did create some angst for Dali and his family, whom by the way recently had their first child, a beautiful baby daughter born last November. The online experience extended into the dealership experience too. 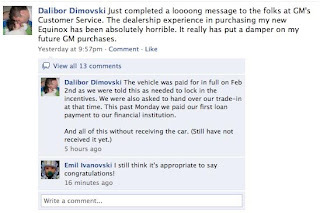 Dali shares, "upon walking into the dealership, I was floored by the response from my salesperson. He mentioned that he had heard about my updates on Twitter and was glad to have been contacted by the GM Customer Service team. The dealership did not realize I was that frustrated as I had always been patient and cordial in communication with them. They respectfully corrected the situation, making me an incredibly happy buyer in the end." The resolution shows how effective social media can be in rapidly turning a bad situation around. What I personally like most about this example is that everyone was considerate to Dali’s issue and there was no grandstanding or over promising going on. After a week of hearing about how much of a blowhard Kevin Smith is when he isn't happy with a company, it was great knowing not everyone is a jerk on Twitter when things go south. One of Dali’s final tweets came late yesterday after he had finished picking up the car from the dealership and ending on a positive note. I’m sure it felt like a great day for the GM team, as a side effect it gave everyone in social media a positive example of how this social stuff works. This story disturbs me a bit because, although I am a fan and follower (on Twitter) of both Dali and Christopher Barger, it occurs to me that there are several underlying issues that should be addressed. For a start, there is the quote from Dali near the end of this debacle: "The dealership did not realize I was that frustrated as I had always been patient and cordial in communication with them." 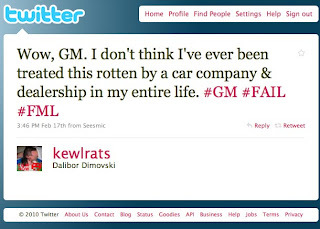 What was the amount of energy that GM Social Media exerted to respond to Dali personally across several Twitter accounts and then communicate with the dealership plus, what was the true reaction that the dealership had of the call received from the GM HQ? 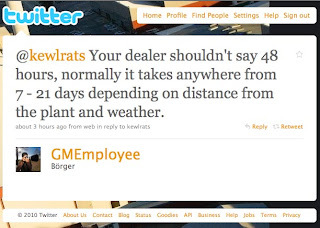 Not that I believe for a minute that Barger or anyone at GM would be less than cordial and helpful working on a call with the dealership issue but there is always that inevitable reaction, resentment and fear of having a franchisor call out a business owner on interactions that they had previously perceived to be "patient and cordial". Frankly, it is embarrassing to the dealer and the already stressed employees. Many of us, Dali not excluded, are well aware of the pressure that Barger is under at GM with a reduced team under him working for a company with a financial black eye. Imagine the rush attempting to please one guy that happens within a company who is being publicly taunted as "Government Motors". This leads to the questions of if Dali's complaints in the social media sphere were justified, perhaps passive aggressive or not and if he chose the proper channels. What happens if a customer doesn't want to deal with a business when they have a complaint and go to the Better Business Bureau? They go on the BBB site and register a complaint. The BBB contacts the business and asks f they would like to respond to the complaint. If they do want to respond, the BBB charges a fee of approximately $40-100 per person employed by the business to gain access to the form so that they can respond to the complaint. (This is based on a personal business experience with the BBB). Imagine what that costs a dealership. 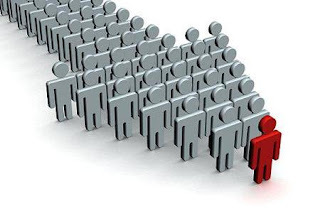 Dealerships typically have 40+ employees. They have to pay profit on a few cars to just address a complaint and not let a passive aggressive person leave a searchable negative comment on the web about the business. It is permanent. Back to the auto industry: if only 2 customers per quarter (responses are typically low even for high volume dealers) respond to the JD Powers questionnaires that are emailed and/or mailed to customers after a dealership experience and one person answers positively and one answers negatively, the average will be failing and the dealership will lose their quarterly OEM bonus/incentive and that is usually about the entire cost of a car. $15K+, depending on the brand. Let's be clear here. Any tactic that a customer takes that is not directing complaints directly to a dealer is costing that dealer a lot of money, time, stress and affects the dealer/OEM/buyer lines of communication in ways that are expensive in "man" hours. If the customer thinks they are having a bad experience, imagine the lasting effects of that bad experience on how other passive aggressive-perceived customers will be treated by small business owners. Is Facebook and Twitter the place where this should happen? One of my best friends had prepaid a vacation with his wife on JetBlue. His wife, weeks after giving birth to their 2nd son, was diagnosed with a deadly brain tumor. They had purchased a 3rd party insurance through the JetBlue website and they were attempting to get a refund because she was starting chemotherapy and there would be no vacation happening then, if ever. The 3rd party company was unresponsive and at best was giving them 1/3 of their money towards future flights. My friend was frustrated and tired, scared and taking care of a newborn weaned too early because mama was so ill. Doctors didn't know if she would survive another month and they were low on money. I did a shout out @JetBlue on Twitter and within minutes had a DM from @JetBlue who resolved the issue within hours. That is what communicating with large companies through social media is all about. Rant done. It is amazing how many people will use social media or review sites to slam a business without first reaching out to the ownership or management. What ever happened to "I want to speak with your manager!" In my experience many of the issues could have been worked out with something as simple as a phone call. 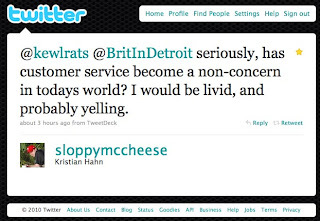 I chase down online complaints and work to resolve them as part of my job. I personally never intended to even look for a response from GM via social media, only to state my situation and hope that others could either give me advice or bear with me while I ranted. What GM's team did wasn't even expected by me. I was able to leave the dealership a happy customer, instead of a dissatisfied one, and would go as far as saying that the dealership and GM's team have earned my respect back. I need to reiterate that what was/is posted on Twitter wasn't the only conversation that took place. It was often the outcome of many phone calls and emails. In fact, social media served in making that initial connection between me (the customer) and GM (the supplier of product) that I didn't feel I was getting before. Thanks for the clarification. As with any story like this unless you are directly involved with the situation it is easy to criticize. The lesson learned here is social media facilitated a conversation between parties to resolve a major issue. Makes us internet geeks all warm and fuzzy. I wish every dealer would assign at least one employee to engage in the practice of active www participation. In the end there is no excuse for poor communication in this digital age. Always great to see resolution. Thanks for a continued interesting dialog on this situation that played out over the past couple days. I must say that I never got the impression that Dali was someone not going through proper channels or that his public comments where a way to get other people at GM to respond. Instead, I think GM was just simply listening and people from the social media team and others from GM not on that team reacted positively to help Dali's situation. This was all very different from someone sending a direct message to a company like Kevin Smith did to Southwest Airlines. Smith's early tweet about his issue was an attempt to get the company to respond: "Dear @SouthwestAir - I know I'm fat, but was Captain Leysath really justified in throwing me off a flight for which I was already seated?" Dali did no such thing. He simply voiced some public frustrations with a car purchase and had a dialog with his like-minded car friends on Twitter and Facebook to see what people thought. GM was the one who came to him and wanted to help remedy the situation. I do think Michelle's comments about Better Business Bureau and dealership JD Power ratings do shed some light on how criticisms are handled in the industry. I bet, however, that Dali's resolution would lead to some high marks on a JD Power survey and no compliants to the BBB. This was mainly resolved through listening and then assisting to make sure the customer's problem was resolved in a positive way. That happened whether Dali expected it or not and by his own words it was totally unexpected which to me shows an even more powerful example of some excellent customer service in this example. Forex, Belajar Forex, BelajarForex, Trading Forex, Forex Trading, Strategi Forex, Sistem Forex, Belajar Forex Trading, Belajar Trading Forex, Rahasia Forex, Cara Trading Forex, Forex Trading Sistem, Sistem Trading Forex, Trading Sistem Forex, Rahasia Trading, Rahasia Trading Forex"
Looking back on this entire customer service issue and it's resolution, I am sure that everyone at GM would like to have their current PR disaster in progress resolved as easily as this... One cannot help but compare the Toyota PR disaster that was occurring when this blog was posted with what GM is dealing with today. Think about all the mistakes that Toyota made back then, yet they came out of it stronger and better than they were before it began. Is it possible for GM to recover in similar fashion? Is it probable?